Now, you may ask, “Why would you bother to go through all this hassle?” Well, the first thing to understand is that technology in Argentina is considerably more expensive than in the US. I priced out some HDTV models in Buenos Aires and they tended to be close to three times the price as in the States due to the excessive duties that the Argentine government levies on imports. It made sense to me to bring one from the States. So, after a lot of research, I chose the Samsung LN46C650 46″ LCD HDTV from Amazon.com for U$S 949.98 and had it delivered to my address in the States. The comparable model in Buenos Aires was over U$S 3500! I really wanted to get a LED model, but they were considerably more expensive and the extra taxes at customs would have added on even more to that, so I settled for the LCD. The process started with re-packing the TV inside the original box that came from Amazon. I filled the box with packing peanuts and bubble wrapped around the screen. I also packed an extended shower curtain rod behind the TV, because good ones are impossible to find here, but I figured it provided additional support too. I then taped it shut and for good measure taped all around the outside of the box as well with re-enforced packing tape. I wanted to make sure that I had the best protection possible. When we arrived at JFK, we went to curbside check-in, because we had four suitcases, the Samsung TV and a Chicco travel system (2 large, over-sized items). In true NYC style (or Argentine? ), the friendly baggage handler offered to “help us out” by only charging us $100 for each extra bag, and waiving the overweight and oversize charges if we “took care of him.” At this point, my double-parked rental SUV was being examined by two armed National Guards, so I quickly handed him $50 for his trouble while trying to make my way back to the car. He told me,”Now, I know you meant to give me more than this.” At this point, the guards were yelling at me to move the truck, so I asked Laura to give him another $50. Obviously, “taking care of someone” costs more than I originally thought. The process was relatively painless. I returned the rental car, boarded the flight, and picked up the TV in Buenos Aires. When we went through customs, we presented the receipt for the TV and the customs form, went to the window to pay the duty and headed home. The TV works great on Cablevision Argentina’s digital cable and we have a beautiful high-def picture. The other benefit of this model, that we were not originally aware of is that it is multi-voltage, so it works without needing a voltage converter. We even found flat screen installers on MercadoLibre who came to the house with all the necessary equipment to hang it on the wall. I might have to do this every time I travel to the US. It was definitely worth it. 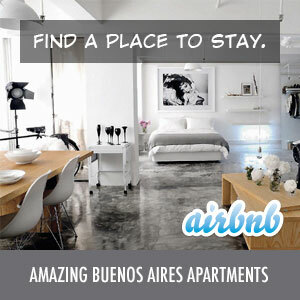 Vote for Discover Buenos Aires!